We arrived here shortly before opening. After a swift half of Landlord in the nearby Old Ship (not listed on the site), we returned for the Craft's opening at 3:30. This is a pub on the corner of the busy Commercial Road. You could literally roll out of Limehouse DLR station straight into this establishment. The barman was welcoming and there was a good selection of beers, especially craft ones. Kent Craft Pale Ale is a regular ale on cask. In addition, there were 3 Thornbridge ales - Brother Rabbit, Cocoa Wonderland & Lord Marples, plus Totally Brewed 4 Hop Men of the Apocalypse. Nice traditional interior, with a couple of modern touches. There is a further room upstairs and an outdoor terrace also on the upper level. My second favourite pub of the day and the best of the ones listed on this site. About to re-open as a Craft Beer Co establishment. The area is turning and judging by visits to other Craft Beer Co pubs this will be a good one….will visit soon. Freaks local as most Railway places seem to be. Clicky at times. Real Ale is surprisingly good. Decent enough management and staff. Dartboard and juke box. 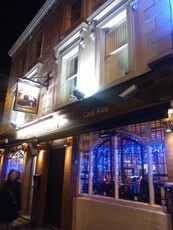 Overall I would return ,strangely it is one of the best pubs in the locality. Really quite ok, one real ale on (London Pride), plenty of people about. Walked past it on the way to the Mariners but found the Mariners had shut down so came here instead. Not horribly cheap (�3.20 for Pride if I remember correctly) but not expensive either and pleasantly down to earth. 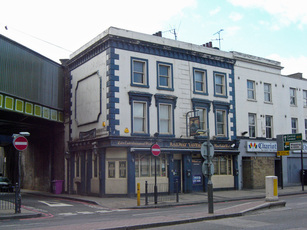 Was always a decent pub for a quick pint when getting off the train at stepney east station (re named Limehouse) particularly when Alan owned it.